Microsoft recently teamed up with British fashion designer A. Sauvage to create the world’s first trousers that can wirelessly charge a smartphone. 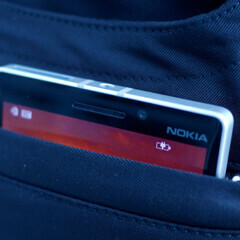 Showcased in London earlier this week, the trousers use technology from Nokia’s DC-50 portable wireless charging plate, and they can charge a compatible Lumia Windows Phone handset when the device is placed inside a pocket. The innovative trousers will be available to buy “soon” via Amazon (only for a limited time, though). Their price hasn’t been announced, but, according to Business Insider, their designer believes it will be “over $340”. The problem with these pants is that they can’t be washed - so you’ll probably not want to wear them too many times. They’re more like a prototype for now, but one that’s going to be commercially available. “We have a proud history of working within fashion, having previously collaborated with Bruce Weber and David Bailey, as well as recent partnerships at New York and London Fashion Week. Continuing this theme, we are excited to work alongside a talented designer such as A. Sauvage. As well as having the vision to co-create these amazing wireless charging trousers, his style complements the cutting-edge design of the new Lumia 930 smartphone perfectly,” declared Adam Johnson, Marketing Director for Microsoft Mobile (UK and Ireland). So, what do you think about these wireless charging trousers? If you like the idea, Nokia allows you to win a pair - but only if you're based in the UK (see the second source link below). At $340 each. Not to mention its made only for some Nokia lumias smart phones. They better not make a lot of these. Its not like these things are going to fly off the shelf. Better hope no fail safes, fail. Seems kind of inconvenient to have to carry around a battery in your pants. BTW, would this work with a Nexus 5? Ohh my gawd... Kudos to MS, Thats why MS is my favourite company. its probably the last thing i want to buy for my phone! some pants full of signals or whatever to just charge my phone!!!!! How ridiculously stupid. You can just carry a battery charger in ANY pants you already have and can wear any appropriate shirt with it. And you dont have to worry about the pants charging signal going into the wrong hole!! Yeah right - like I REALLY want more magnetic fields that close to the family jewels!